We moved into this house three years ago. At the time we had a 4 yr old, a 2 yr old, and one on the way. Our backyard isn’t small, but it isn’t large either. It is all patio though, with a few (not so great) vegetation choices. At the time, it was plenty of space for the Wunderkids but as they’ve grown (and we added a third) the yard has become less and less “kid-friendly” and isn’t nearly enough room for their creative energy to be burned off. Yesterday I had an idea….it was a wild one, that was going to take a lot of hard work, but any of you that know me know that wasn’t going to stop me! We have a side yard area that has been completely unused. I never really knew what to do with it and it was overgrown with weeds, bushes, and tall grasses. Oh! and it had a 3 ft metal stake, the kind you would use to tie up a large dog, protruding from the ground. 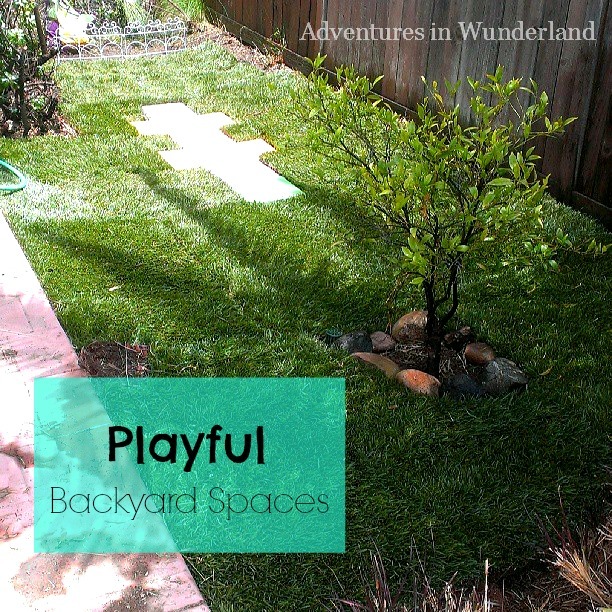 To say the least, the side yard was a HUGE safety concern and was off limits for playing. I wish I had a ‘real’ before picture, because the one posted below doesn’t show you how bad it really was. We cleared a lot out before I took this picture. My fabulous idea was to dig up the metal stake, dig up those patches of deer grass, and laydown soft sod for the kids to play on! But of course, my imagination did not stop there. I wanted to add a little bit of fun so we decided to add a Built-in Hopscotch. To accomplish this I was going to need a few things. The concept really isn’t all that hard, although the manual labor is. Rolls of sod are a lot heavier than they look! I started by painting the tops of the cement step stones. using some bright colored paint I had leftover from Wundergirl’s bedroom walls. Next, I had to level the ground and make sure it was moist. 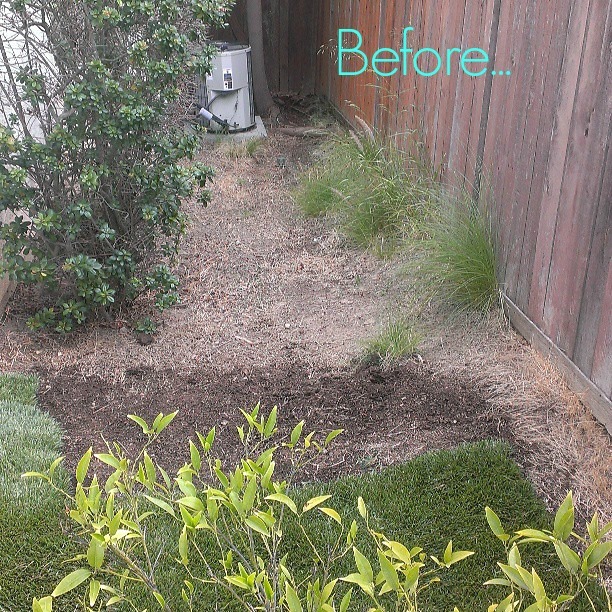 Once the ground was leveled I put down a layer of the soil/fertilizer mix and raked it out to make sure it was evenly distributed. Then it was time for the sod. Sod is sold in rolls so it is fairly easy to roll out and place where you want it. You want to make sure the seams are as close together as possible. 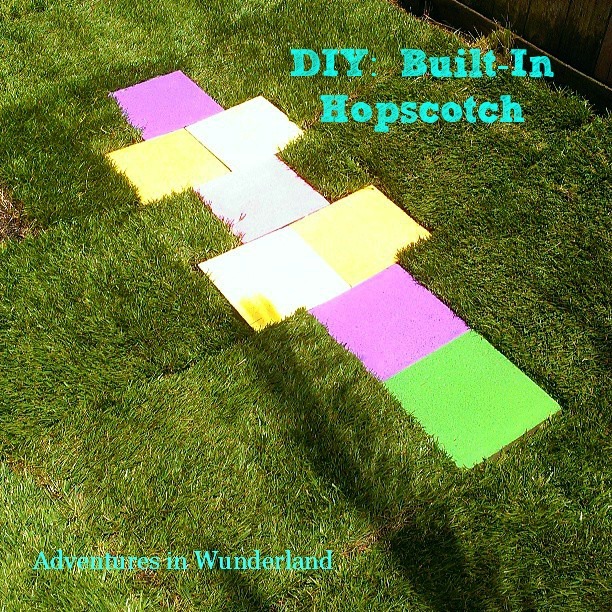 When I got to where I wanted the hopscotch to go I layed out the cement stones, making sure the ground underneath them was level. Then I finished the sod around it, using a sharp knife to cut around the stones. The small lemon tree in the middle was already there. I cut the sod around it and pulled some river rock from the front to make a little planter. I’m thrilled at how it turned out and can’t wait for the kid’s to enjoy there new play space! Great idea for a built in hopscotch!! What a great idea! We don't have kids yet, but I think I may do this in my side yard. I'll pretend it's for children that visit our house, but really, it will be all for me! Stopping by from SITS. hahaha, I think that's a fantastic idea! !